In 2012, A H Baldwin & Sons Ltd sold the magnificent Prospero Collection of Ancient Greek Coins, from The Prospero Library, one of the most prestigious and important libraries to appear on the market for many years, at their New York Auction. This year the sale of the accompanying library will take place at A H Baldwin & Sons. 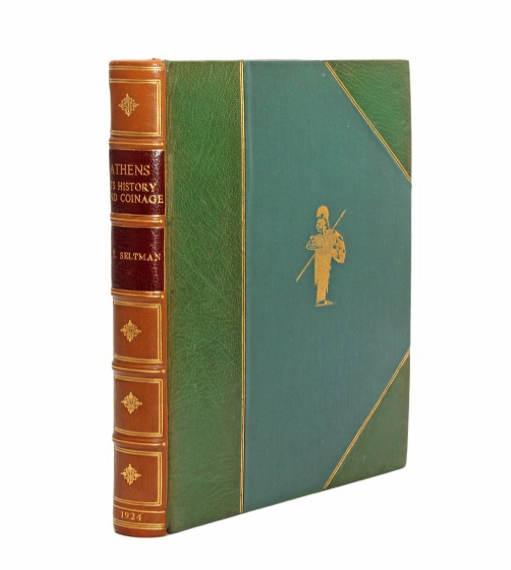 The library contains many of the standard reference works for Greek Coins, many of which are beautifully bound by the renowned bookbinders Sangorski and Sutcliffe. 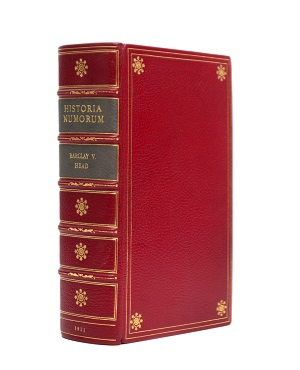 The majority of this library is in superb condition, with extremely rare volumes. Rizzo, G.E. Monete Greche Della Sicilla. 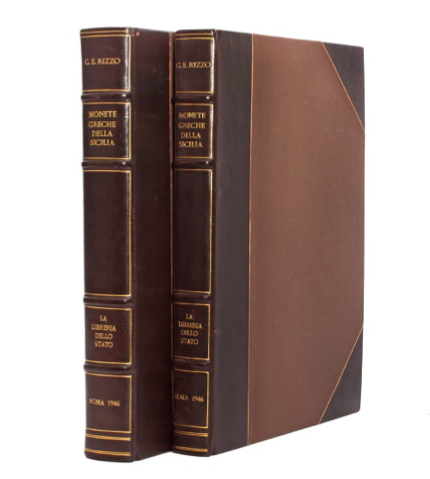 Rome, 1946, two volumes. Folio, pp. fine photographic plate as frontispiece, title in red and black, vii, 319, (2), 98 very fine illustrations, some in colour. Both volumes finely bound by Sangorski and Sutcliffe in half dark brown morocco and cloth boards. Raised bands to spine, ruled and lettered in gilt. Still the standard reference for coins of Sicily and one of the most attractive and artistically produced works on Ancient Coins ever published. Very seldom seen and most highly sought after. Rare and important. Number 387 of a limited run of 425 – '...a very detailed work that is the most complete and easiest to use...Because this was published while the ashes of war were still settling, it is quite rare and in extreme demand'. 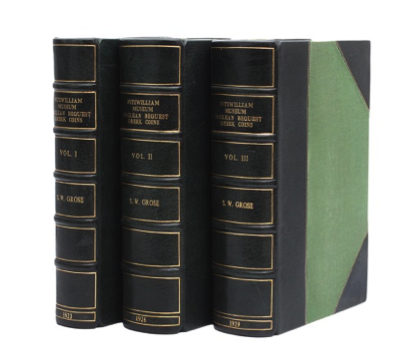 Catalogue of the McClean Collection of Greek Coins Volume 1: Western Europe, Magna Grecia, Sicily Volume 2: The Greek Mainland, The Aegean Islands, Crete Volume 3: Asia Minor, farther Asia, Egypt, Africa Complete in three volumes, all three uniformly bound in dark green morocco and matching cloth boards. Raised bands, panelled and lettered in gilt. A very good set, expertly bound. A superb record of this remarkable collection, listing over 10,000 coins, now housed in the Fitzwilliam museum. 'This is one of the great collections, expertly catalogued...Also includes some very useful indices, including a geographical index and indices to types, inscriptions, monograms, symbols and persons. These indices, along with the vast scope of the collection, make this one of the most useful catalogues for scholars, collectors, and dealers in Greek coins'. Head, B.V. Historia Numorum. A Manual of Greek Numismatics Oxford 1911. Thick quarto. 966 pages, 5 tables, numerous illustrations in the text. Sumptuously bound by Sangorski and Sutcliffe in full crimson morocco with ornamental panelling and further gilt decoration. A magnificent copy of the best (second) edition of this still essential standard reference, the most comprehensive single volume work on Greek coins. 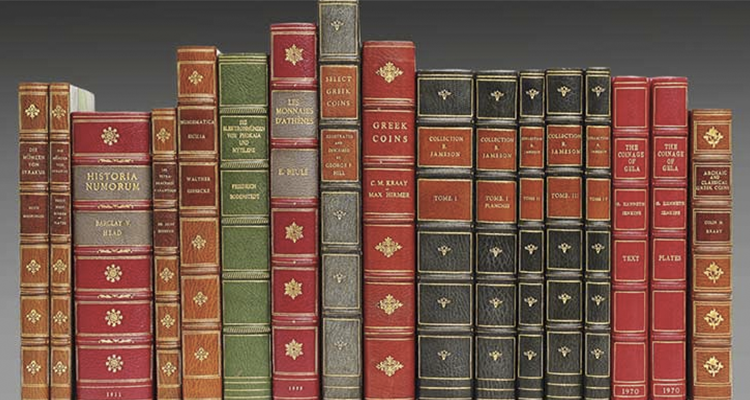 The extensive library has been meticulously catalogued and graded by our numismatic book specialist Caroline Holmes, who shares her praise for the collection: "it has been a privilege to view and work with these stunning volumes. There is something special about holding in your hands something that has survived the test of time – both as an object in itself and the subject matter it contains." The Fixed Price List for the collection will be released mid-September, with previews and updates being released through Twitter (@ProsperoLibrary) and Facebook in the coming weeks. Check out Baldwins on Barnebys here.